Today we are going to learn a new tense in Tulu. This tense is Present Perfect Tense. Do you remember how we made a verb conjuation in simple past tense? In Present Perfect Tense we follow the same rule with a bit difference. We have to just add ‘d’ sound (‘d’ will be changed to ‘t’, if it is a Class A verb) to the verb stem of simple past tense to get the verb stem of Present Perfect Tense. As we learned before, there are three different forms of verb conjugation in Simple Past tense. To form verb stem of Simple Past Tense, replace ‘pu’ with ‘t’. Now add the personal endings to Present Perfect verb stem. To form verb stem of Simple Past Tense, add ‘D’ sound to root verb. To form verb stem of Simple Past Tense, add ‘i’ sound to root verb. When adding ‘d’ sound, the final vowel ‘i’ is removed. So we can add ‘d’ sound to the root verb directly. Personal endings in Present Perfect Tense are same as Simple Past Tense. The Present Perfect Tense may be confusing for new learners as it is pronounced differently from its original form depending on the dialects. All the verbs ending in ‘N’ sound, including Reflexive Verbs are conjugated same as ‘kEndae’ in Present Perfect Tense. Here ‘d’ sound changes to ‘t’ since it is a Class A verb. If you have any questions, feel free to comment. See you next week! 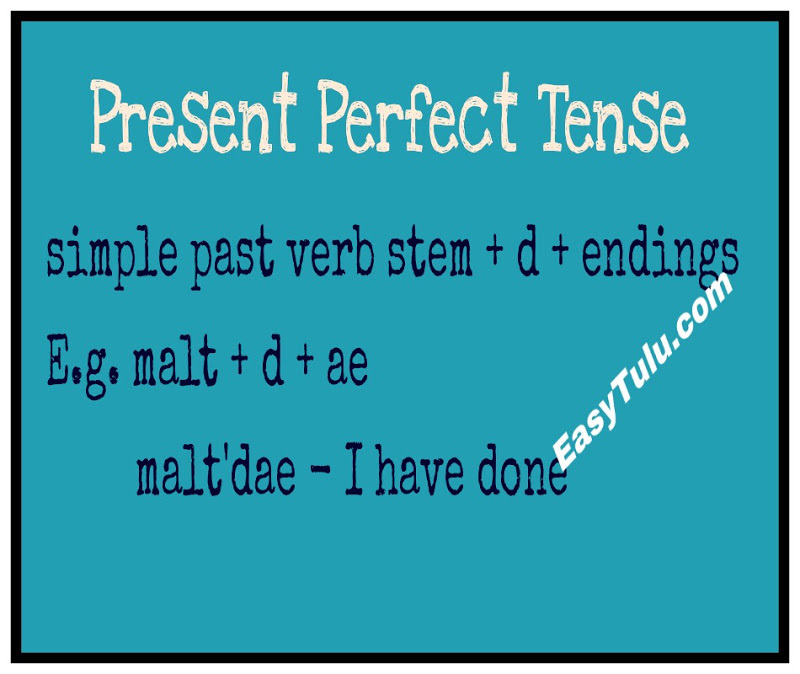 So far we have learned Simple Present, Future Tense and Simple Past Tense in Tulu. The tenses we have learned are good enough for us to take another step. Before going to other tenses, I am going to start a different part of the Tulu language. Today, we are going to learn some simple adjectives. Adjectives are words that describe or modify nouns or pronouns. Generally it tells about quality, quantity, size, shape, age, colour and material of nouns or pronouns used in the sentences. Click here to learn more adjectives in Tulu. 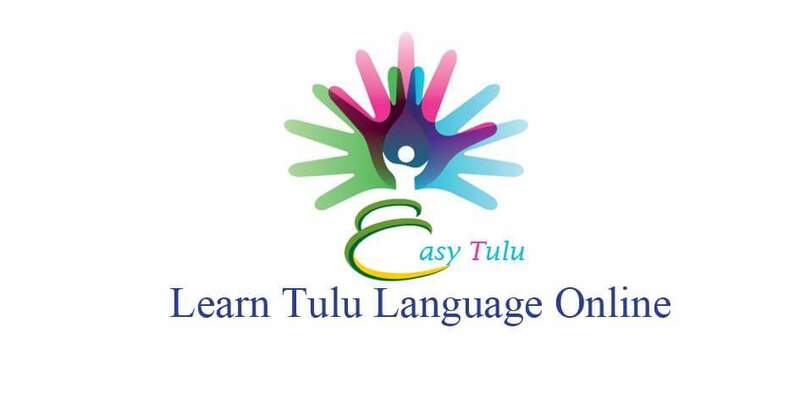 Click here to learn colours in Tulu. Colours and numbers can also be used as adjectives. English: There are seven rooms in my house. Kannada: nanna maneyalli ELu kONegaLu ive. 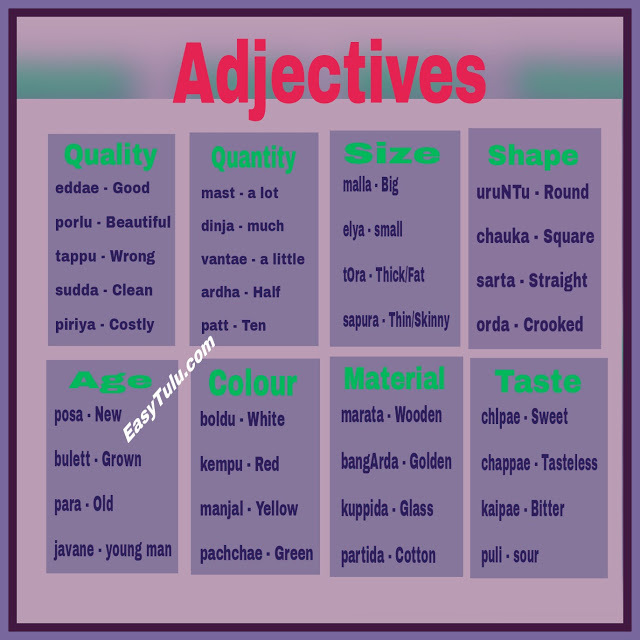 Adjectives can be formed from different words like nouns and verbs. But they are used in Genitive case (suffix ‘da’/’ta’ or ‘na’). We will learn how to form adjectives from verbs in coming lessons. 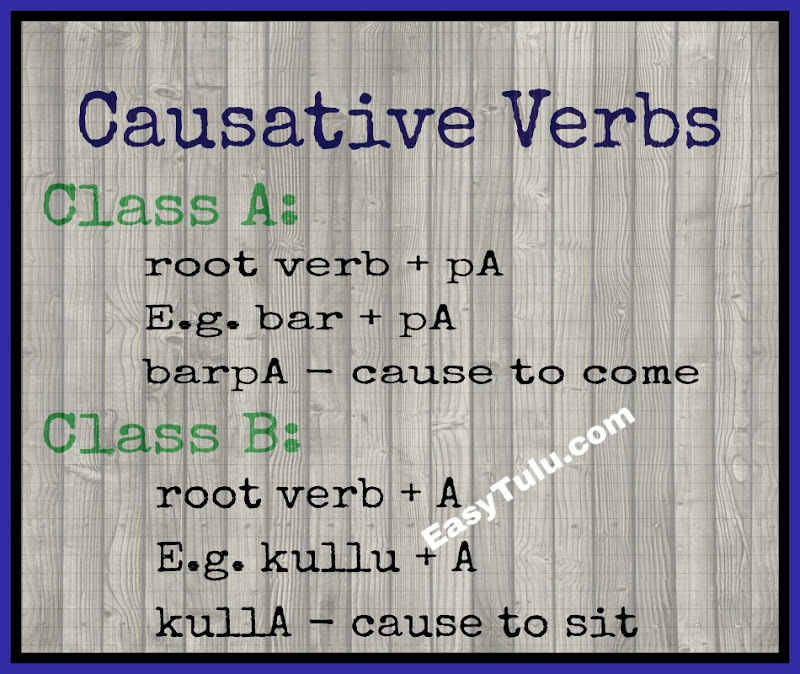 Comparative Adjectives: There are no comparative adjectives in Tulu, but it can be expressed by using ablative case. English: Rama is bigger (older) than Duma. English: He is the cleverest of them all. That is all for today. If you have any questions, feel free to comment. See you next week! Last week we have learned how to form causative verbs in Tulu. Today we are going to learn another verb form. Reflexive verb is a verb whose direct object is the same as its subject. It indicates that a person is performing the action for himself/herself. 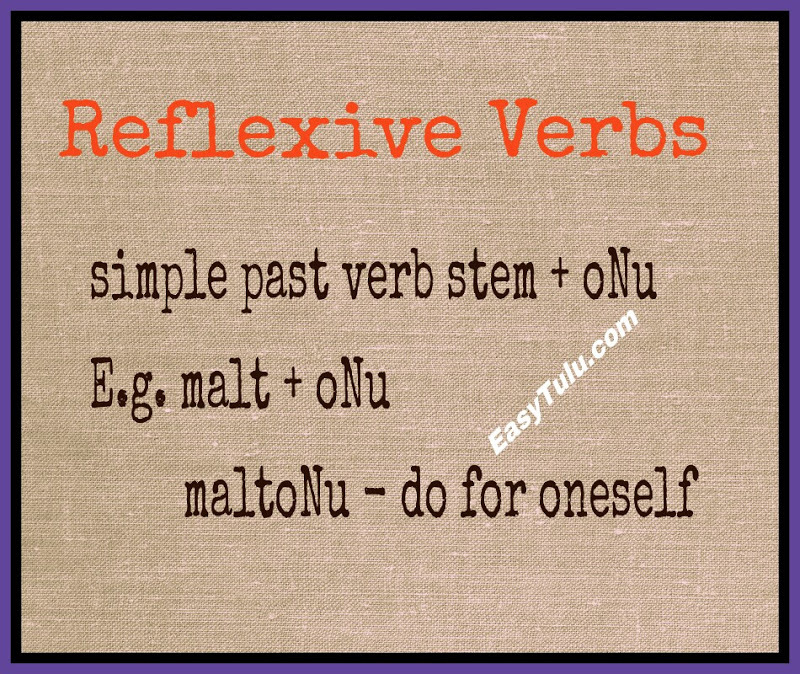 Reflexive form is formed by adding the suffix ‘oNu’ to the verb stem of Simple Past Tense. The suffix ‘oNu’ is derived from the auxiliary verb ‘koNu’ (koNuni – To hold). When you remove personal endings from verb conjugations, you will get the verb stem. Now let us take the verb ‘malpu’ (malpuni – to do/make). In Simple Past tense it is conjugated as ‘maltae’, ‘malte’, ‘maltal’, ‘malter’ etc. If you remove personal endings, you will get the verb stem ‘malt’. However, when adding the suffix ‘oNu’, the final vowel ‘i’ is removed. We can also form reflexive form of causative verbs. Other than this the verb ‘koNu’is also used in forming compound verbs. 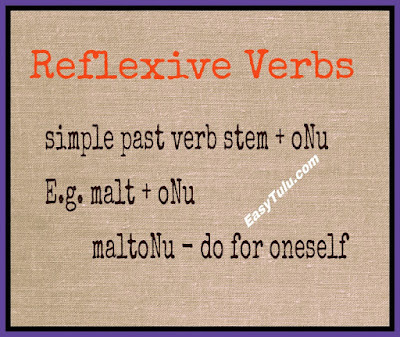 The reflexive verbs usually used with reflexive pronouns ‘tAn’ (himself/herself/itself) and ‘tankulu’ (themselves). Declensions of these pronouns are same as ‘yAn’ (I) and ‘enkulu’ (We). Reflexive verbs are conjugated in the same way like Class B verbs in Simple Present/Future Tense and like verbs ending in ‘N’ in Simple Past Tense. English: He/She borrowed Rs. 100 from me. Tulu: I bUkulen vontae pattoNuvara? English: Can (will) you hold these books for a moment? Kannada: I pustakagaLannu svalpa hiDidukoLLuttIra? English: They had a new dress sewed for festival (for themselves). English: He/She got a boon from God for himself/herself. English: They beat each other. Today we are going to learn causative verbs. Causative verbs express the idea of somebody causing something to happen or causing another person to do something. Let us learn how to make the causative verbs. To make causative forms for Class A verbs, add ‘pA’ suffix and for Class B verbs, add ‘A’ suffix to root verb. This gives us a whole new set of verbs that are easy to memorize since they are made using the verbs we are already familiar with. Sometimes ‘Du’ or ‘DA’ suffixes are used for some verbs. However, these verbs are very few. 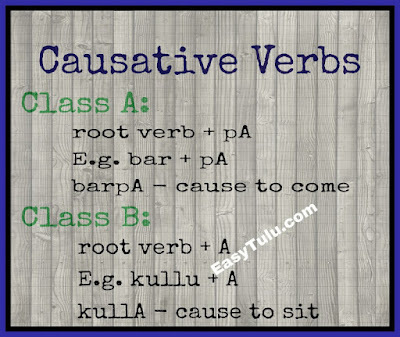 Causative verbs can be conjugated in the same way like Class B verbs. However, these verbs does not have uncertain future tense in positive form (except ‘kaDapuDu’ – To send), but have it in negative form. English: Mother made the child to sleep. English: He/She made the child to cry. Some of the intransitive verbs can be changed to transitive verbs by adding ‘pu’ suffix, and then it can be changed to causative verb by adding ‘A’ suffix. Intransitive verb is a verb that does not need a direct object to complete its meaning. Transitive verb is a verb that needs a direct object to complete its meaning. These verbs can be changed to causative form by adding ‘A’ suffix. English: He cut down the tree.